Suitable for Tape and Hard Disk Drives up to 3.5"
The HD-2XTE is a compact, economical automatic degausser. This machine is ideal for those who want to erase data permanently but don't have a high volume of hard drives to degauss. The HD-2XTE is desk-sized and quiet to use so ideal for use in office settings. 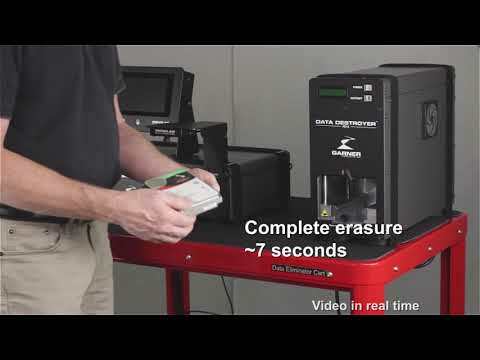 The degausser erases hard drives up to 1.25" high as well as the full range of tape cartridge media. It is simple to use, simply put the hard drive in the drawer, close it and the machine automatically starts the degauss cycle. The HD-2XTE generates 10,000+ gauss magnetic field for complete erasure of hard drives and tape (both working and non-working). It has the capacity to erase 1920 (1.8"); 960 (2.5") and 240 (3.5") hard drives per hour and has a 7 second erase cycle. The LCD display provides visuals to verify complete erasure of the hard drive and the built-in verification system and on board diagnostics confirm the magnetic field strength of every cycle ensuring full erasure of hard drives. The HD-2XTE has a continuous duty cycle so no need to wait for it to cool down between cycles.